It is already halfway into the third week of the new year, and this is an extremely busy time of the year. Kids are finally back in school, work is in full swing again and it seems as if time is flying. While there are many things that may be capturing your attention right now, at Majestic Floors Inc., we believe that there is one thing that should be on your mind: wood floors in Rochelle Park, NJ. Yes, it is the dead of winter, and there are hundreds of rumors that circulate about installing wood floors at this time of the year. Many people warn against re-doing wood floors during the winter, but our professionals think it is a great time to install them. We are a fully-licensed and insured company that has had years of experience with wood floors in Rochelle Park, NJ. When installing wood floors, humidity is a factor that must be taken into consideration. While many say that drier air is easier to install wood floors in, that is not always the case. Moisture from humid air can be trapped under floorboards, causing them to buckle. This can be avoided during the colder months of the year. wood floors are installed in the summer, the boards will shrink in the winter and there will be many gaps surrounding the boards. By installing wood floors in Rochelle Park, NJ in the winter instead, you can plan for the wood to expand and leave room for the boards to grow in the summer months. Dustless wood floor sanding: 99% dust-free floors! Our goal is to re-do or repair your wood floors and help keep them preserved for years. Do not listen to people who say that re-doing your floors in the winter is not a good idea. Our professional opinion, backed by experience, is that it can be done, and your floors will be in the best possible condition they can be in after we are finished with them. If you would like to speak with one of our floor professionals about wood floors in Rochelle Park, NJ for the new year, contact us today at 201-739-1145! Are you thinking about getting hardwood flooring in Norwood NJ? The flooring specialists at Majestic Floors Inc are fully licensed and insured professionals dedicated to taking care of all of your hardwood flooring needs. We will install, refinish, dust or repair any hardwood flooring and guarantee our customers that their floors will be 99% dust-free. 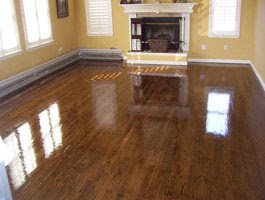 If you are looking to refinish hardwood flooring in Norwood NJ, now is the perfect time. Winter and early spring are much more ideal climates to refinish hardwood floors than summer. The summer’s humidity can cause size changes in hardwood, making gaps in the flooring probable. Any wood flooring professional worth his weight in salt knows that it is best to leave the window closed throughout the refinishing process. A heater presents more ideal conditions than air conditioning, because not as much air blow. If dust gets blown on a the finish before it is fully dry, it can leave marks. We have a special dustless hardwood floor sanding system that prevents creation of airborne dust particles and leaves your floor 99.9% dust free. Because of this, you will not have to waste your precious time by covering furniture and walls. It also prevents inhalation of wood dust. Aside from wood flooring, we will also install marble and ceramic tiles. Marble is very extravagant. The word is derived from the Greek word marmos and means shiny stone. Marble is formed when limestone re-crystallizes. This is what gives marble its distinct colors and patterns. For more information on our Norwood NJ hardwood flooring services, call us at 845-356-1144. Winter is a popular time of year for homeowners to redo their hardwood flooring because of the low humidity, but improving the look of your home is not the only purpose hardwood floors have. Did you know you can actually heat and cool your home through them as well? With flush wood floor vents in Bergen County, NJ, your heating and cooling can blend in seamlessly with the rest of your floor. Majestic Floors Inc. is a fully licensed and insured flooring company in Bergen County. One of our most interesting products right now is our flush wood floor vents, which help homeowners avoid cumbersome baseboard vents that often get in the way. The flush wood floor vents are simply a part of the floor and do not interfere in busy areas of the house. Keep your family warm for the remainder of winter and look forward to painless cooling this summer with Majestic Floors’ flush wood floor vents in Bergen County. For more information on the wood flooring services we provide and to set up an appointment give us a call today at 201-739-1145 to speak with one of our experts.